The East Side Gallery (sometimes shortened to ESG) in Berlin is the longest remaining section of the iconic Berlin Wall. One of the major tourist attractions of the city, it is now a memorial to freedom with artistic contributions from internationally recognized street artists around the world. At 1.3 kilometer (nearly a mile) long, this is one of the largest open-air galleries in the world. But it was once instrumental in dividing East from West Berlin. 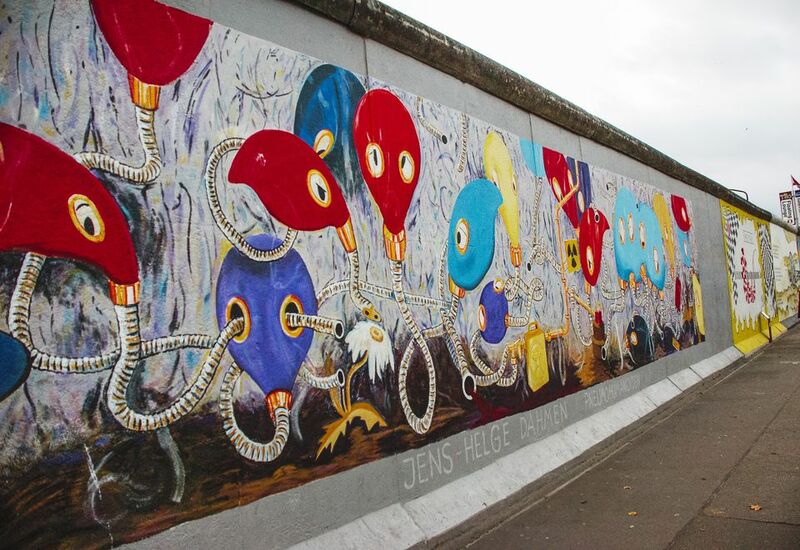 Learn about the history of Berlin's East Side Gallery and how you should plan your visit. After the wall fell in 1989, hundreds of artists from all over the world came to Berlin to transform the grim wall into a piece of art. They covered the east side of the former border which had been untouchable up to then. There are more than 100 paintings by 118 artists from 21 different countries, referred to as the Kunstmeile (art mile). However, the wall's legacy is far from untouchable. Unfortunately, big sections of the wall have been damaged by erosion, graffiti, and trophy hunters who chip off little pieces to bring home as a souvenir. Please, don't do that. In July 2006, a small section of the wall was moved to offer access to the River Spree for the new monster stadium, O2 World, which hosts everything from Madonna to the Eisbären, Berlin's hockey team. Another section was removed in March 2013 to make way for luxury apartments. Some of the artists' work was destroyed without notification and the consumerism and gentrification touching such an important memorial rankled the community. Peaceful demonstrations (including an appearance by the one and only David Hasselhof) delayed the work, but the section was eventually removed. Today, the wall is still an impressive stretch between Ostbahnhof (East Train Station) and the stunning Oberbaumbrücke running along the River Spree. For the 20th anniversary of the fall of the Berlin Wall in 2009, the most beloved paintings were restored and preserved and these works are still periodically touched up. The removed sections do allow better access to the river and this riverfront section has become an idyllic hang with food and souvenir stands and lots of grassy patches to lay out. The back side of the ball has now also been adorned with amatuer graffiti proving street art is alive and well in Berlin. This is also the location of a themed Pirates bar and restaurant as well as the Eastern Comfort Hostelboat. The murals reflect the turbulent German history, and many bear the slogans of peace and hope. The bright cartoon faces from Thierry Noir have become a symbol of the city and can be found replicated on countless souvenirs. Another iconic painting is "Der Bruderkuss" (The Brother Kiss), or "My God, Help Me to Survive This Deadly Love", by Dmitri Vrubel. It shows the fraternal kiss between former Soviet leader Leonid Brezhnev and East German Prime Minister Eric Honecker. Another crowd-pleaser is Birgit Kinder’s "Test the Rest" which shows an East German Trabi caught bursting through the Wall. Start your tour of the East Side Gallery at Ostbahnhof and walk alongside the wall until you reach the bridge, Oberbaumbrücke. Warschauer subway station lies just north of here and is another option for where to start your tour. Watch the bike path! This popular stretch of sidewalk is quite narrow near the bridge and gawking tourists need to watch their step and listen for the bells of speeding bicyclists..
Avoid the crowds by visiting the memorial in the evening. While your pictures may not be as crystal clear, they will be without the thousands of milling tourists. Plus the river and bridge are beautifully lit at night. If you want to avoid the overpriced eats set against the river in the removed sections, get a bite at Ostbahnhof which offers all the typical fast food options. I can also recommend Scheers Schnitzel on the Friedrichshain side of the bridge. If you are still hungry, cross over Oberbaumbrücke to Kreuzberg and let your stomach run wild.